"MINACCIOLO MEETS ART": A PAINTING EXHIBITION FEATURING AUGUSTO AGHI A unique experience combining art and furniture awaits you at the Minacciolo showroom. A journey through works of art with an original charm will accompany you from the kitchen to all the other rooms of the house. From May to October, in conjunction with Expo 2015, Minacciolo will be pleased to welcome you to its headquarters for the initiative "MINACCIOLO MEETS ART", a series of art exhibitions held in a 1,200-square metre furniture showroom. The first event will feature the artist Augusto Aghi, who will exhibit his works on canvas with installations in the various rooms of the house, with an interesting mix of contemporary art, "country chic" furniture and furniture with a more modern design. With this event, Minacciolo plans to give new meaning to the traditional concept of an exhibition, bringing works of art into the domestic environment, in close contact with furniture and, especially, with the kitchen. An original initiative focused on creating a connection between various fields of art, from painting to interior design, taking place not far from the wonderful cities of Venice and Treviso. nnection between various fields of art, from painting to interior design, taking place not far from the wonderful cities of Venice and Treviso. ion, knowledge and exploration, taking place not far from the wonderful cities of Venice and Treviso. "MINACCIOLO MEETS ART" includes a visit to the showroom for the entire month of May, from Monday to Saturday, with free entry. The Minacciolo headquarters are located in Via Postumia Ovest 61, in San Biagio di Callalta (TV). Minacciolo is characterised by a defined style that delicately unites traditional artisan craftsmanship with contemporary design. The high degree of coordination that is a feature in all of Minacciolo’s furniture provides an endless number of various different solutions. Every year Minacciolo updates their own products so they can guarantee cutting edge technology, thus offering components and household appliances that are up to date and tie in perfectly with the unique feel they have created. 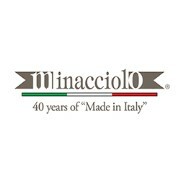 Set in the lowland area of Treviso, the Italian furniture company Minacciolo is celebrating its 40th anniversary this year. A surprising outcome if you consider how it was all founded. The founder and current owner Maurizio Minacciolo was hardworking and passionate, both qualities which set apart those who succeed. He transformed a simple workshop into an industrial success which then became amongst the most prestigious in Italy and listed in the stock exchange. The initial idea was to industrialise the manufacturing of country furniture in the ampezzo-tirol style which was highly fashionable in the early 70s. As a result of the refined woodwork and the innovative furniture collections that were being sold, the Company was making headway and began to develop its commercial and distribution structure. 1991 was a major turning point. Minacciolo continued innovating and constantly working to make themselves the best they could be. From this the “Tolà” collection was born. This was a collection of original country style furniture where elegant colours such as “green sage” and “powder blue” elegantly emerged to reflect provincial, English and Umbrian-Tuscan styles. In 2001, during this commercial boom period, another important manufacturing milestone was achieved. Minacciolo created the new “English Mood” collection that was immediately successful. Characterised by delicate and refined lines, this collection gave an added chic dimension to the country style and as a result a renewed personality and a new development in furniture. From its original design which appealed only to country homes Minacciolo’s new country chic design opened up a whole new dimension moving into the city apartment market. Over the following years, the “English Mood” collection was constantly being developed and expanded, continually being adapted so as to meet the new demands on the market. Craftsmanship and design culture are values on which Minacciolo’s manufacturing continued to be based, in particular in the field of wooden furniture and furnishings to suit every room in the house. An authentic “Made in Italy”,made even more exclusive by the use of eco-friendly materials and processes, used together with the most cutting-edge technologies took the company to international market leader position amongst furniture manufacturers for country style and contemporary. As well as a trend setter for brands it was once again market leader for the country chic style. Today, this collection offers a complete “house program”, offering unprecedented elegance and stylistic continuity in any home: from the kitchen to the living room, from the bedroom to the bathroom. As well as this already appealing and recognised collection, in 2012 Minacciolo created two new collections for Eurocucina, with an original and personal contemporary: “Minà” and “Natural Skin”. Two innovative and technology proposals, designed in the spirit of being contemporary brought together the materials, traditions and timeless qualities of wood and metal. Two additional lines which work together to create original and innovative spaces thanks to the inclusion of equipment and professional units which encourage a new way for the spaces to be used. In order to design real country style contemporary furniture, Minacciolo takes exclusive advantage of highly experienced specialised wood workers thus combining their skilled craftsmanship with on-going innovative technologies. The high degree of coordination that is a feature in all of their furniture provides an endless number of various different solutions. Every year Minacciolo updates their own products so they can guarantee cutting edge technology, thus offering components and household appliances that are up to date and tie in perfectly with the unique feel they have created.